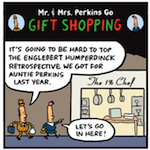 Cartoonist Jen Sorensen sends her ‘everycouple’, Mr. and Mrs. Perkins, to the mall in search of gifts. But is there anything worth buying? Having trouble getting into the festive spirit given all the bad news in the world? 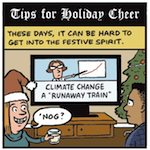 Cartoonist Jen Sorensen offers some sardonic tips. 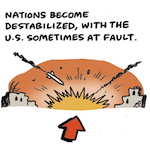 Cartoonist Jen Sorensen outlines the cycle of actions and conditions that promises to exacerbate the global refugee situation. 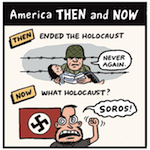 In four frames, cartoonist Jen Sorensen compares U.S. attitudes and influence decades (or just a few years) ago with now. 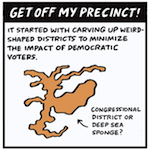 Once upon a time, Republicans in office began carving up weirdly shaped districts to undermine Democratic voters. 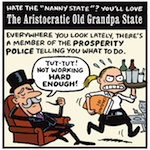 Cartoonist Jen Sorensen imagines how far things could go — and and actually are going, in one state. 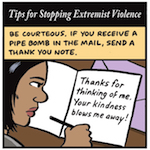 How do we counter extremist violence? 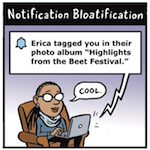 Cartoonist Jen Sorensen illustrates a few methods guaranteed not to work.